This has been such a non-stop week with news writing and speaking engagements that it just hit me that I did not share with you all the details of my speaking trip to Pensacola, Florida on last weekend from February 6-7. The invite came from a group that I met in that city during the Grassroots Media Tour back in October. The organization is called Movement For Change (MFC) and has been in existence since the early 90's. 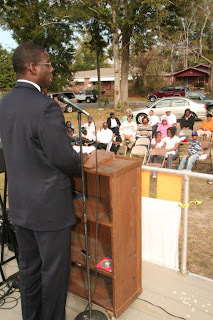 I was invited to be the keynote speaker at their 2nd Annual Stop The Violence Rally on that Saturday. But on Friday, I spoke at Gaines High School, which is considered the last chance for many students who have been kicked out of the public school system. I addressed 100 students on the importance attaining to greatness and not settling for the labels that many may have placed on them. A few cried and some of them said to me "That's exactly what I needed to hear". The next day was the Stop the Violence rally. Prior to speaking I had a chance to hear the town's new Sheriff, one of the city council members, a Black student leader from West Florida University, a choir and an awesome young saxophonist. I am going to blog about the saxophonist real soon! Just like every city in America, Black on Black violence is rising in Pensacola so my message was taking from a text by the Honorable Minister Louis Farrakhan titled "The Cause and Effect of A Violent Society"....and the weather was perfect! I thank Mr. Boyd (MFC President), Ms. Della Denny-Abbott (MFC Event Coordinator), Mr. Danny Lewis (who escorted me the whole weekend) and all of the MFC members for the humble invite! Let's all work to BE the change...don't wait.